Daniel Snider/US Air ForceClaudia greets her husband, Lt. Col. Gary Symon, upon his return home. Much of what the media report can seem negative or downright depressing. That’s because two of the main objectives of journalists, especially those covering people in power, is to expose wrongdoing and shine a light on problems in society so they can be fixed. But it’s also important to highlight the good that happens around the world – stories of triumph and courage, community and giving back. Hurricane Harvey brings out the best in Americans. Amid the destruction caused by Hurricane Harvey in parts of Texas and Louisiana in August, many people came together to support the victims most in need. Residents loaded up rowboats, pontoons, and fishing vessels to rescue survivors stranded on their roofs because the floodwaters in the Houston area were so high. Miguel Juarez and others from the Texas Rio Grande Valley created a make-shift aid station, where people could pick through supplies like hygiene products and cereal. Juarez also set up a free water station at his truck. One family near the Barker Reservoir in Houston escaped flooding on an air mattress. When journalists from the local news station ABC13 found them, they pulled them to safety aboard their vessel. And grocery chain H-E-B, which is based in San Antonio, deployed a convoy of disaster-relief vehicles, including mobile kitchens and pharmacies, to Victoria, Texas. Grateful residents poured into the parking lot for a hot meal. A Philadelphia man giving free haircuts to the homeless gets a free barbershop of his own — from a complete stranger. Global Citizen/YoutubeBrennon Jones, 29, of Philadelphia, gives free haircuts to the homeless. 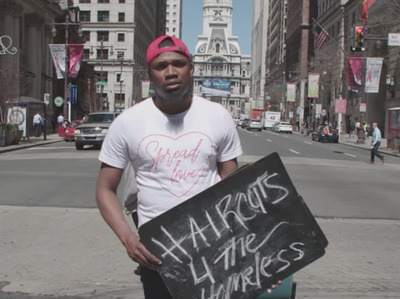 In January, 29-year-old Philadelphia native Brennon Jones started a the charity “Haircuts 4 Homeless“, helping the homeless clean up so they could get jobs. His goodwill caught the attention of a Philly-area barber shop owner, who decided to donate a fully-furnished barbershop space for Jones to continue his work. Jones says it’s more than just a haircut. Cleaning up, and talking to a barber can boost morale and confidence, too. A wounded Las Vegas shooting victim fights his injuries to stand when Trump comes to shake his hand. Thomas Gunderson/FacebookThomas Gunderson fights his fresh gunshot wound to the leg to stand and shake Trump’s hand. 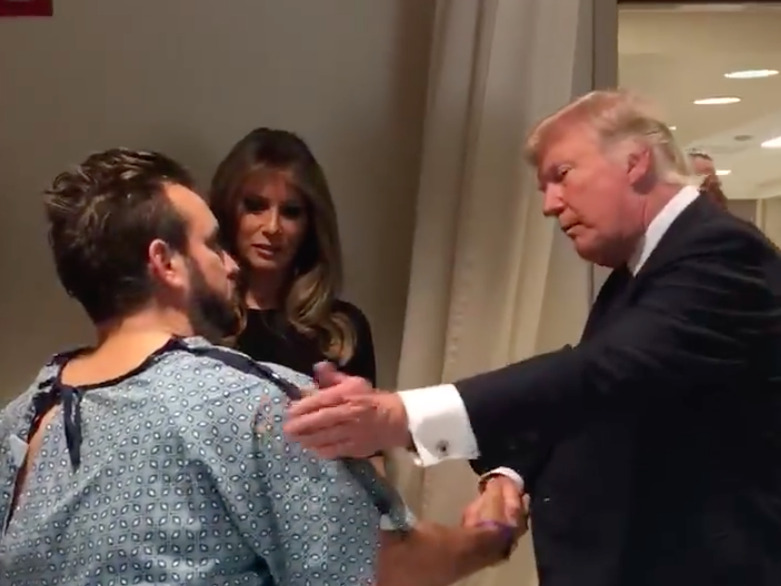 When President Donald Trump toured a Las Vegas hospital in October after the US’s deadliest mass shooting in living memory, 28-year-old Thomas Gunderson pushed through his injuries to stand up and shake his hand when he entered his hospital room. “Hey, this guy looks tough to me,” Trump said of Gunderson, who was recovering from a fresh gunshot wound to the leg. “I will never lie down when the President of this great country comes to shake my hand!” Gunderson wrote in a video of the encounter he posted to Facebook, which has since garnered 26 million views. After months of waiting, YouTube star April the giraffe finally gave birth to a healthy male calf. @AprilTheGiraffeApril and her young male calf. 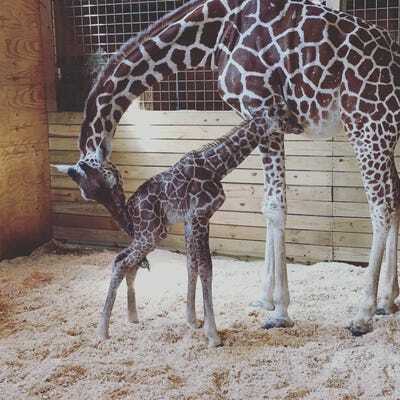 In April, at least 1.2 million people watched the Adventure Park’s YouTube streaming of 15-year-old April the giraffe giving birth in an enclosed pen in Harpursville, New York. The video of April went viral after millions of fans had waited months for the giraffe’s impending birth. Giraffes are usually pregnant for 13 to 15 months. Zookeepers thought April was overdue, but may also have also miscalculated her due date. Rep. Steve Scalise of Louisiana recovers after being shot by a gunman. In June, Republican Rep. Steve Scalise of Louisiana was among four people shot during a practice for an annual charity baseball game featuring members of Congress. Four months later, Scalise threw out the first pitch before a playoff game between the Washington Nationals and the Chicago Cubs. He received a standing ovation. In September, he made a triumphant return to the House chamber to thunderous applause from his colleagues on both sides of the aisle. Scalise’s presence at the practice was likely what prevented the incident from becoming a massacre, because his security detail as House Majority Whip was there to neutralise the shooter. The wife of a fallen soldier tracked down the owner of her husband’s old car to buy and give it as a gift to her son for his 16th birthday. Jessica Johns/FacebookJustin Rozier’s mother bought him his dad’s old car for his 16th birthday. Rozier’s father died while serving in Iraq in 2003. Justin Rozier barely knew his father. The former US Army lieutenant was killed while serving in Iraq in 2003, when his son was just 9 months old. 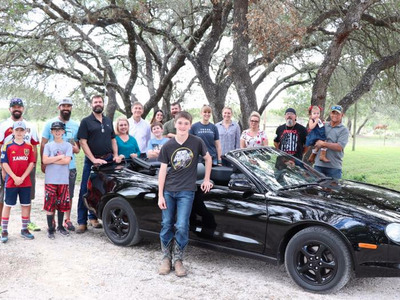 At the time, Justin’s mother, Jessica Johns, sold her husband’s car so she didn’t have to “keep chipping away at my savings to pay for a car that nobody was using,” she told NBC News. This August, Johns made an appeal on Facebook in search of the car’s owner to see if she could buy it. She wanted to re-buy the car to give to her son for his 16th birthday so he had something to remember his father. Johns tracked down the owner within days. He agreed to sell her the 1999 Toyota Celica, and she gave it to Justin for his 15th birthday. “I think that your son will get more enjoyment out of having his dad’s car than I would,” the owner told her. 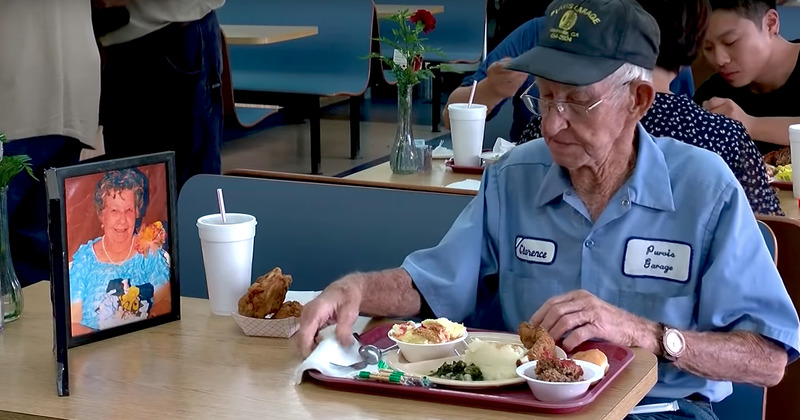 A 93-year-old Georgia man displays a photo on the table while eating lunch to honour his late wife. WTOC Extras/YoutubeClarence Purvis, 93, eats lunch with a photo of his wife, who died four years ago. Clarence Purvis, 93, lost his wife Caroyln four years ago. They were married for 64 years. Although she is gone, Purvis never eats lunch without her. During meals out at a restaurant where the couple used to go, Purvis sets up a framed photo of his wife on the table. Homeless veteran gives his last $US20 to help a stranded woman get home. In return, she raises nearly $US400,000 for him. Kate McClure/GoFundMeJohnny Bobbitt Jr., 34, who was once homeless, spent his last $US20 to help a stranger, Kate McClure, 29, get home after she ran out of gas on the highway. Kate McClure was stuck on a highway in Philadelphia when she ran out of gas. She didn’t have money and couldn’t get home. 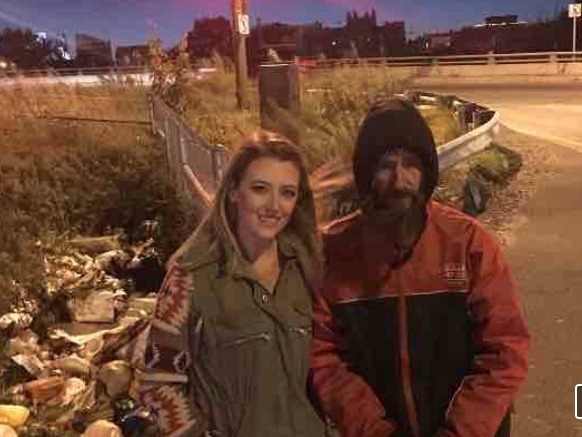 It was then that a 34-year-old homeless veteran, Johnny Bobbitt Jr., came up to her and said he would use his last $US20 to buy her gas. McClure and her boyfriend eventually repaid him. Then, they devised a plan to raise money for Bobbitt to get back on his feet. So she set up a GoFundMe page, soliciting donations. They ended up raising close to $US400,000. The couple says the money will be used to rent Bobbitt an apartment and pay for his food, clothing, mobile phone, and transportation. 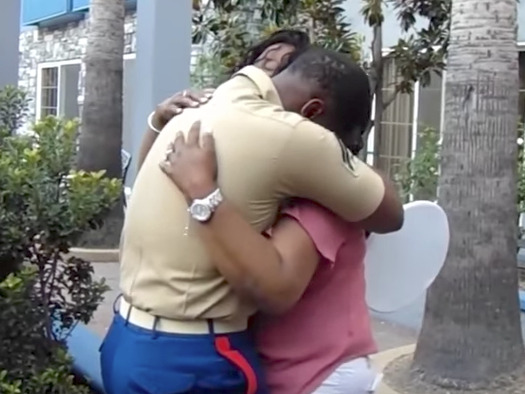 A US marine surprises his mother with a trip home. DailyPicksandFlicks/YoutubeNaim Tauheed surprises his mother during a family reunion upon return from military deployment abroad. Naim Tauheed, a US marine deployed abroad, hadn’t seen his mum in 2 years. 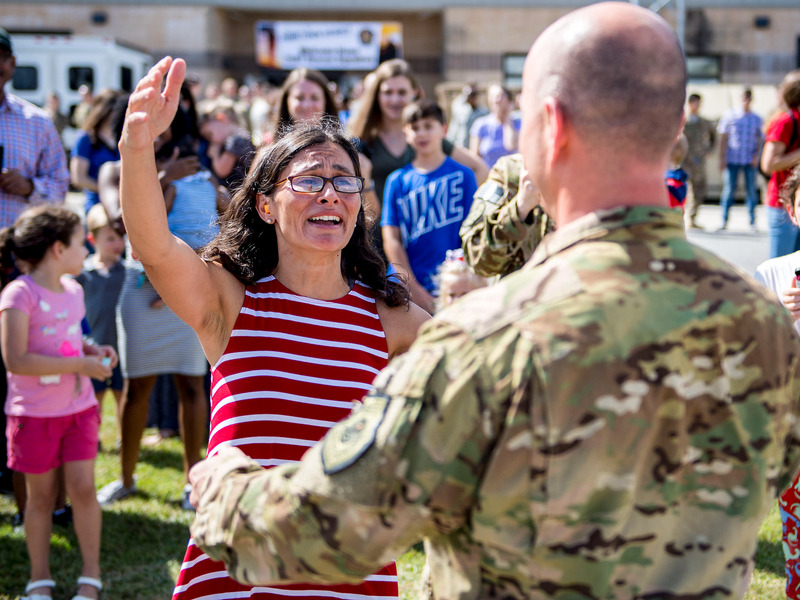 Luckily, he had a 1-month window in between deployments and decided to surprise his mum during a family reunion at her home in Los Angeles.